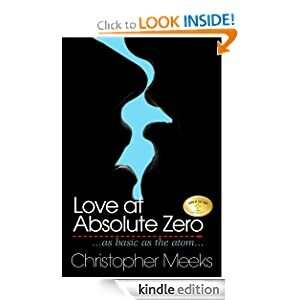 Our interview today is with Christopher Meeks author of Love at Absolute Zero (4.2 stars, 32 reviews). Before we get to the interview a brief book description: Love At Absolute Zero is a comic romance about Gunnar Gunderson, a 32-year-old star physicist at the University of Wisconsin who’s determined to meet his soul mate within three days using the Scientific Method. As he channels his inner salmon for speed dating, he accidentally steps on the toes of a visiting Danish schoolteacher–and his life turns upside down. Kirkus Reviews, the publishing industry paper, had you write for them a piece called “How I Did It”—how you became a successful indie fiction writer. Do you have the Lamborghini in the garage now? Do you get the best seat at Musso and Frank’s in Hollywood? What does success feel like? I drive a Hyndai and stand in line at The Oinkster. The word “rich” and “writer” rarely go together in the same way “rich” and “educator” don’t. If you’re out to be wealthy, try a different field, say dentistry. I’m successful in that people read my books and sometimes write me. I deeply pleased and remain forever thrilled, too, that my two collections of short stories, The Middle-Aged Man and the Sea and Months and Seasons, received such great critical notice when they first came out. After all, I’d been a book reviewer for two newspapers for a few years and a theatre reviewer for Daily Variety for eight, so I’d been on the on the other side. Many of my fellow reviewers were ruthless. Now I was the creator. I didn’t know how I’d fare. All I aimed to do was write the truth as I knew it. It worked. The publishing part, though, took a lot more work than I expected. When my agent wouldn’t send out my short story collection—“Only novels make money,” he said—a friend convinced me to start my own publishing company. After all, he had worked with me at Prelude Press when I was the senior editor there in the eighties. My friend Daniel was a book designer and said he’d design my first covers for free, so I took the leap. This was in 2005, before eBooks but just as print-on-demand first gained a toehold. My little company, White Whisker Books, used print-on-demand, and everything else I did was the way we’d done it at Prelude Press, including my hiring a freelance editor and sending out physical copies to reviewers. My first book went out in 2006. My first review for my first book, The Middle-Aged Man and the Sea, was in the Los Angeles Times. Later that summer, Entertainment Weekly mentioned it. It was beginner’s luck—but with purpose and a plan behind it. When my agent found enthusiastic editors for my novel Love at Absolute Zero, but the marketing departments said no, I had White Whisker publish it after my first novel, The Brightest Moon of the Century. The critical response has been fabulous for my novels, too. Now I’m publishing a couple of other writers. Because I’m naïve and want to do good things. I’m publishing three great writers right now, E. Van Lowe, David Scott Milton, and Shelly Lowenkopf. I knew them, they’ve all been published previously, and came to me to get help in this new publishing environment. We’re finding our way together. We’re Lewis and Clark and Clark and Clark. Isn’t writing old-fashioned and going the way of the phone on the wall—or the Dodo bird? Isn’t film or, say, cell-phone webcasting the way to tell stories now? Books will always be around. Some of my students are reading them on their cell phones, but so what? Their eyes scan the letters across the screen and find meaning. They get excited. I’m lucky to be both teaching and writing—and being published and publishing others. Did you know you’d be a writer early in life? Ha! No. I wanted to be a director, and that’s why I moved to Los Angeles originally. To hear more of that story, read the Kirkus article. The important thing is I found my storytelling medium. What inspired you to write Love at Absolute Zero? I studied in Denmark during my junior year of college. I’d followed a young Danish woman I’d met in Minnesota the summer before, but by the time I got there, she was living with another young man and had neglected to tell me. She arranged for me, however, to live with her parents, which, believe me, wasn’t my idea of happiness. It was the most depressed I’d ever been—away from my friends, family, and even language. A few years ago, the situation, in hindsight, seemed very funny to me, and there’d been plenty of emotion: perfect for a story. However, I didn’t want to write about the past or about a college student. Rather, when I’d lived in a town called Roskilde, frequenting a bar called The Number Two, I’d met a lot of American physicists who worked nearby. Denmark is huge into physics, so in conceiving this book, I thought of them and some of the brilliant but socially clueless scientists I’d met at Caltech, where my wife worked in the astrophysics library. Why not have a star scientist fall in love—scientists can love, right?—and I’ll put him through hell in Denmark. Thus, the novel is about a 32-year-old physicist who, in getting tenure at the University of Wisconsin, decides now he can have a wife, and he’s going to use the scientific method to find one in three days. However, he accidentally steps on the toes of a visiting Danish kindergarten teacher. He follows her to Denmark, where he learns what a black hole really is. It’s very funny. One of the things I love about writing novels and short stories is often I get to research another lifestyle and career. I thought my scientist, Gunnar Gunderson, would be a nuclear physicist, but I learned Denmark banned anything nuclear in the eighties. I then managed to interview the head of the Niels Bohr Institute, who told me the hot thing in physics now was the ultracold. What happened to matter near absolute zero was changing the world. Thus, I had to study quantum mechanics, and in the process, I learned there’s an amazing connection between atoms and love. You’ll see when you read the book. Going into my novel, you don’t have to know or even like science. If secretaries and plumbers can love, so can and should physicists. You were born and raised in Minnesota. Has that influenced your writing? I was saddled with a happy childhood. I rode bikes with my brothers and cousins. We lived in a community called Maplewoods, where my grandparents lived in a big house and called their home Freedom Hall. I sailed and skated on Lake Minnetonka. I shot Estes rockets into the air and dreamed—and yet dramatic writing is about conflict. Still, this world tends to be brilliant at dishing out conflict. There’s plenty to write about and consider. My parents had nearly eight acres, and the woods were large. It was a place to be alone and think—and those cold winters made one hearty. My stepfather had us work the property nearly every Saturday. There were trees to plant, gardens to weed, lawn to mow, our house to stain, logs to haul, and our long gravel driveway needed raking. At the time, it felt as if we were on a chain gang, but it gave me a work ethic. A few years ago, I took this photo of our property, below. I will say some fellow Minnesota authors have shown me a few things, too. F. Scott Fitzgerald showed me how one’s experiences in life become the backbone of stories. Charles Baxter has shown me that non-standard narratives can be fascinating. Garrison Keillor and Midwesterner Kurt Vonnegut reminded me that humor is not only okay but necessary. Tim O’Brien, especially in his collection The Things They Carried, reinforced the importance of story and that truth must be at the heart of everything. You didn’t mention another Minnesota writer, Amanda Hocking. Amanda Hocking, a young Minnesotan who has made millions in her paranormal romance novels, first showed me that indie publishing is a force. There are many things to learn as an independent marketer, and the parameters are changing all the time. When no one would publish her, she sold her books for 99 cents and chatted on a website called Kindleboards. People found her, and now a big publisher has brought her into the fold. There’s a great New York Times article on her by Strawberry Soroyan, daughter of Aram Soroyan, who I team-taught with at USC. The more you write and teach, the more interesting people you find in this world. What Makes Good Fiction Good?